It is commonly said that the internet has revolutionised our society: We do not communicate as before; we do not interact as before. Nevertheless, if compared to traditional media such as TV, the internet is still not our main channel of communication. Over the coming years, traditional mass media will continue to play an important role, and they will remain one of our main sources of information. However, it is also clear that traditional media are becoming increasingly interconnected with the web as there are more and more TVs and other devices that come with web access. Today, even appliances such as refrigerators can be accessed online. It is no longer possible to grasp the meanings of our lives, our societies without referring to the internet. The web provides first-hand information that is not filtered by any corporation. Any citizen can freely access all kinds of information and find content that fits his or her interests. Having said that, it is still all but clear how the internet may be able to contribute to civil participation. The question is vast, and likely there is no short answer to it. The Euroblogosphere is part of the internet – and at the same time it is part of the European public sphere. The Euroblogosphere is a community of individuals with a common interest in European topics. They are watchdogs of European institutions, and their point of view differs from that of the traditional media. The Euroblogosphere can play an important role on the way towards greater political commitment and more democratic participation. Interviews with independent bloggers show that the European blogosphere is transnational in character and constitutes a community of individual citizens sharing information and ideas concerning European topics. Through their interactions they do share the same practices, problems and worries – and consequently there are no significant differences between them; the result is a common blogger identity. Importantly, these bloggers also have a shared interest in the EU, something that can be interpreted as a sort of common European feeling. The Euroblogosphere can be seen as a tool towards greater democratisation as it contains elements of democratic governance. It has three major principles: participation, deliberation, and governance. Every citizen can become part of the Euroblogosphere, and this offers the possibility to discuss freely every relevant topic with other citizens. The result is that bloggers are able to elaborate their ideas and make conscious choices between political and social alternatives. However, it would be going too far to call this governance. Bloggers can be biased or very selective in their reasoning, something that may curtail open debate, while, on the other hand, bloggers do not possess any powers to make decisions. Right now, the Euroblogosphere is still a very small niche and its influence on European debates is consequently small. Nevertheless, it represents a type of soft power, something that, while it is still in its beginnings, is yet slowly gaining strength. In practical terms bloggers are able to influence people by building up expertise – and trust in their expertise – with the possible result that citizens will regard them as trusted sources of information and analysis. This is what we call liquid democracy. Presently, this is hardly ever the case as the influence of bloggers is still very limited. Yet, there is a lot of potential, and institutions should be aware of the fact that bloggers may influence peoples’ attitudes towards EU policies. In the future, Eurobloggers may become something like a popular lobby, giving voice to the interests and grievances of common Europeans. Their present influence may be minuscule, I expect however that, over the coming years, it will see a steep rise. The two major issues the Euroblogosphere is facing are, one the one hand, a lack of profound and productive debates and, on the other, the language barrier. Although, over the last few years, debates have become increasingly interactive there are clear signs that the level of debate has plummeted – a development very much driven by the limitations of social media. More recently, many debates have become shallow and insipid, as more and more bloggers have switched to Facebook or prefer to tweet their comments – developments that severely hamper the level of debate. The second problem is idiomatic. The dominance of English has resulted in a Euroblogosphere that is frequently either lopsided or garbled – or that will fragment into discrete language-based blogospheres, with English playing the dominant role. In consequence, these two factors impede the transnationality of the Euroblogosphere. 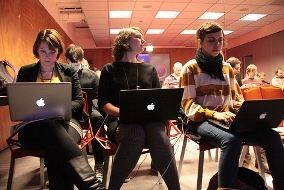 The Euroblogosphere may still become an important factor in European policy debates and increase popular participation. If the Euroblogosphere, continues to grow, it will, one day, become an important complementary part of a European Public Sphere, yet one not so very different from other groups and channels of communication (traditional media, associations, NGOs, websites, forums, etc). The website blogginportal.eu is a platform for hundreds of blogs, hundreds of websites that promote greater European integration. Also, some other steps have been taken to increase the influence of Eurobloggers, for example when the European Presidency (Cyprus) invited bloggers to an official meeting. The Euroblogosphere offers citizens a perfect way to express freely their ideas and grievances. Eurobloggers thus contribute to a more democratic debate as they express points of view different from what can be found in the traditional media – and by involving the citizens.